Letter from Lieutenant Bagold at Fort George, regarding the progress of his own case following Cullen's directions. Letter "Franked" by his commanding officer, Sir Eyer Coote. 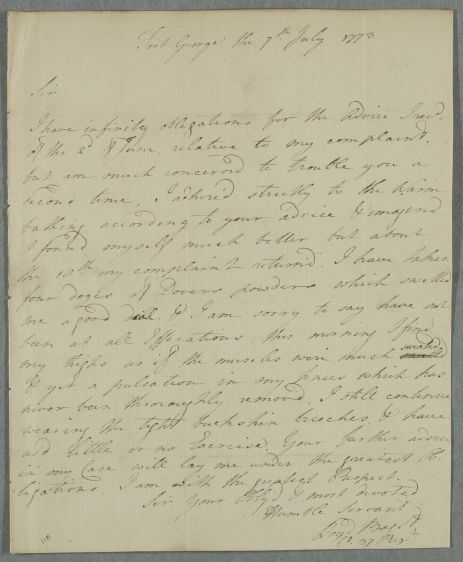 Summary Letter from Lieutenant Bagold at Fort George, regarding the progress of his own case following Cullen's directions. Letter "Franked" by his commanding officer, Sir Eyer Coote. Case of Lieutenant Bagold at Fort George, whose treatment, which includes the wearing of tight buckskin breeches, has caused him to sweat. 1: Sir Eyre Coote (1726-1783), was commandant at Fort George (from 1773 to 1778). 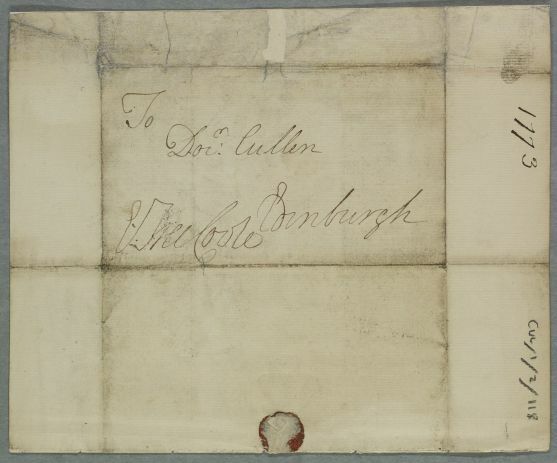 His signature here serves as a "frank" indicating that, as a favour to Bagold, he is drawing on his privilege as Member of the House of Lords to not incur any postal charges.